Applying a monochromatic color scheme is an easy way to give your home a harmonious look. It involves choosing a single base color and then decorating predominantly with various shades and tones of that one color. 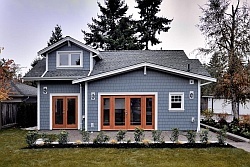 For small houses especially, using a monochromatic design has another advantage. Keeping everything in the same hue tends to make small spaces appear bigger. The owners of this appealing little cottage chose white and shades of gray almost exclusively for the finishes and furniture. There is a little bit of color contrast in the natural wood tones of the deck and a few accent pieces. Variety was also added by including textures ranging from grooved wood paneling and glossy tile to coarse sisal. 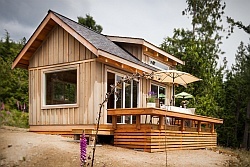 The cottage has two bedrooms in its single-level floor plan of 57 m2 (614 ft2). The floor plan is L-shaped with an inset porch at the inside corner. Keeping the porch under the main roof, rather than tacking it on the side, tends to reduce the cost a bit by simplifying the roof construction. The living room looks spacious while the eat-in kitchen is quite compact. Many people might choose to move the dining area into the living room and then add more kitchen storage and counter space. The bathroom features a shower with folding walls, a space-saving idea that we haven’t yet seen outside Scandinavia. The shower walls are hinged to the bathroom walls and fold flat when not in use, freeing up floor space for drying off and dressing. 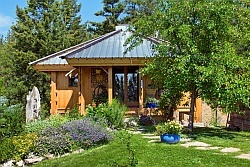 There is also a composting toilet, suggesting that the cottage may be off-grid. Photographs courtesy of Mäklarringen. Via Forfur. 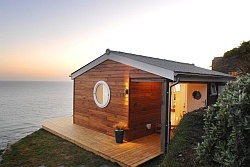 I love the little house. It is perfect but for me it screams for color! BTW, I don’t understand the shower. I don’t see an edge for the shower bottom—nor a drain although there must be one! Hi Dorothy, you’re right there must be a drain somewhere out of view and the whole bathroom floor would be slightly sloped towards it. That kind of arrangement is pretty common in Europe but not so much in North America. I would love to know the manufacturer of that shower; it looks like the bottom has a gasket on it that would work as a water sweep, and I’m sure there’s a drain there somewhere. Great design; this would be eye-popping on the days when there was snow outside on the ground – very good for people who suffer from lack of sunlight in the winter. (Must admit, I too, couldn’t help but want to put a screaming red pillow or turquoise blue bowl somewhere, though) 🙂 Thank you for sharing. Is there anyway to purchase blueprint for this plan? 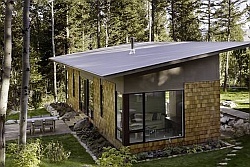 We are planning to build in Sedona AZ and would love to build something like this there. Thanks!!! Eric, all I can tell you is that this cottage is somewhere in Sweden and was apparently built in 1975. But it’s pretty simple so it should be fairly straightforward for a good architectural draftsperson to draw up some plans for you. Whenever I see so little bedroom, storage, and closet space, I want to take covered porches in as part of the living space. The house is adorable, but I think a family, even a couple, would outgrow it very quickly. Include the porch in the heated space. Keep the deck for outdoor living. I would like information about pursuing this style home. In English. I adore the design exactly as it is! Someone read my mind! I too like the design…say have any of you checked out IKEA ? sometimes they build little 625 sq ft house plans inside the building using all their furniture and fixtures…really wonderful to think you can live a modern life in such small spaces…! this is my dream house also…like the simplicity of the shower floor in bathroom also! If you decided to live in a desert setting you could drain all the water you use in the bathroom and kitchen outside to use for gardening or wildlife replenishment! 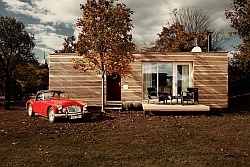 Is there anyone manufacturing this house in the US? and how could I get the plans ?